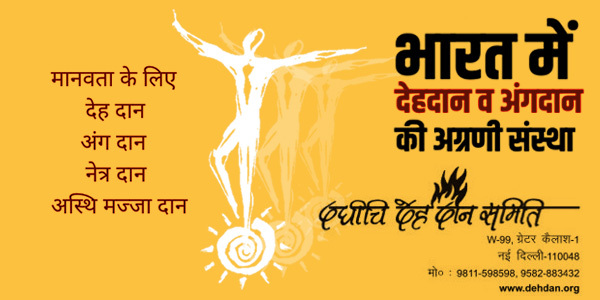 With the inspiration from Maharshi Dadhichi, “Dadhichi Deh Dan Samiti” is dedicated to the cause of Spreading awareness on Body – Organ – Eyes – Stem Cell Donation, motivates people to make a pledge for body-organ donation during life, and gets their pledge executed after death, in Delhi and NCR since 1997. This journey started with five volunteers registering their will for the body donation. Later on, they formed “Dadhichi Deh Dan Samiti” with registration as NGO. With the passage of time, many volunteers joined this spiritual journey and even today there is no paid employee of the samiti. Whole movement is run by committed volunteers. Samiti does not take any financial assistance from any Government agency and all expenses are met by either the volunteers themselves or from donations which come under Tax rebate. Samiti works as a bridge between the Donor family and the Government Hospitals. After death, family of the deceased/ Donor needs to make just a phone call to the Samiti and then the whole arrangements for donation are facilitated by the volunteers of the samiti. Samiti has been successful in executing all the Donations till date after receipt of information from the donor family. For donations after death, identity proof and the death certificate of the deceased are required. Body and Organ donations are made to Government Medical Colleges and Hospitals only. After donations, the samiti has no role in transplantation of organs. Volunteers support the family during the donation process and later attend Prayer Meeting organised by the family to pay tributes to the Donor and gratitude to the family. The families of the donors are honoured in “Dehdaniyo ka utsav”, and wills are handed over along with the certificates to the new pledging donors during this utsav. Since 2010, Samiti has been instrumental in (old data is not available). We also help in establishment of similar organisations in other places for expanding this noble cause. On our request, various religious leaders, political leaders, and important dignitaries have released messages to motivate masses for the cause, which are also available on our website. Specialist doctors have delivered important information on this subject. All discussions and articles on the subject are available on our website and you tube. Pledging to donate organs / Body. As Volunteer of the samiti by giving your valuable time. Providing us table space in your religious, social programmes for spreading awareness. Printing information/ advertisements/ appeal/ slogan etc. regarding body and organ donation in your circulars, magazines, directories etc.